Home › Inspiration › Diana Nyad.. An Inspiration. 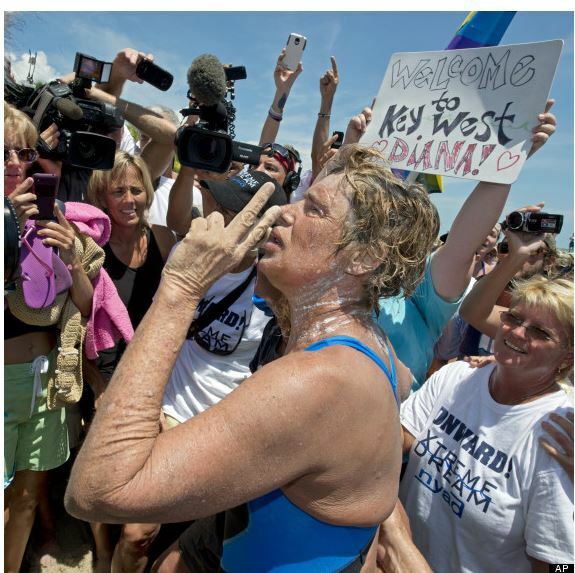 I hope that you have heard of Diana Nyad by now. She should be on the Top of CNN.com, with an incredible article, but she isn’t. 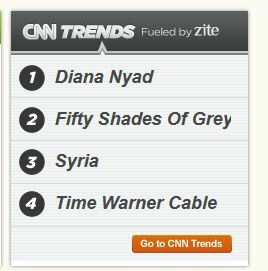 In fact, the only reason she is mentioned on the front page this morning, is because she is at the very top of trending. Though in order to see that, you have to scroll past countless depressing articles about the typical woes in this world. You read that right. She is the number 1 thing people want to read about, and are searching for information on – yet CNN doesn’t have an article up on its cover page. I realize that modern news is a business, and the owners and editors get to determine what we read about on their page. But I for one would rather read about inspiration, then about depression. So I am going to share what I know about her here. In 1979 Diana Nyad was considered to be the greatest long distance swimmer in the world. In 1974, she set a women’s record in the 22 mile Bay of Naples race (8 hours 11 minutes). She broke the world record for circling Manhattan Island (set the new record at 7 hours and 57 minutes) in 1975 (26 years old), and in 1978 at the age of 28 she attempted to swim from Havana, Cuba to Key West – a distance of over 100 miles, from within a shark cage. On this, her first attempt, she swam for 42 hours. She was stopped as the strong winds and waves were slamming her into the cage, and pushing her off course toward Texas. Her distance covered was 76 miles. On her 30th birthday in 1979, Diana swam 102 miles in open water from North Bimini Island, Bahamas – to Juno Beach Florida, without the use of a shark cage. This was the new record for distance swimming over open water – for both men and women. Now lets skip ahead a few years.. Diana worked as a sportscaster, wrote a fitness book, one can’t say she lead a totally “normal” life however, as she continued to test herself through physical endurance. Bike Riding (100 miles), water-deprivation, and other things that occurred to her. But she never forgot her failed attempt..
At the Age of 61, in 2010 – Diana decided she needed to finish what she started. In January of 2010, she began training for this great feat. When asked why? Weather issues forced her to put off her 2nd attempt until mid-2011, but on 7 August 2011 at 7:45, she entered the water from Havana’s Marina Hemingway and headed toward Florida. Strong currents, winds (these pushed her of course), shoulder pain and an asthma attack forced her to leave the water after 29 hours. 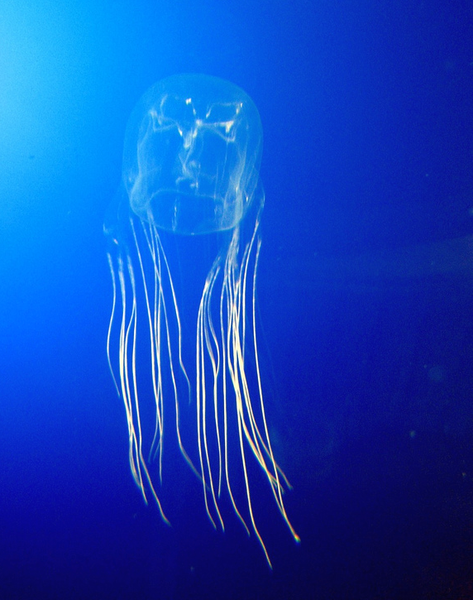 She had been stung twice by box jelly-fish. The second sting was around her neck – this is considered to be a contributor to her issues breathing. On her third attempt, she added a catamaran to her Support team. This boat towed a streamer (used red LEDs at night) to help her maintain her course toward Key West. 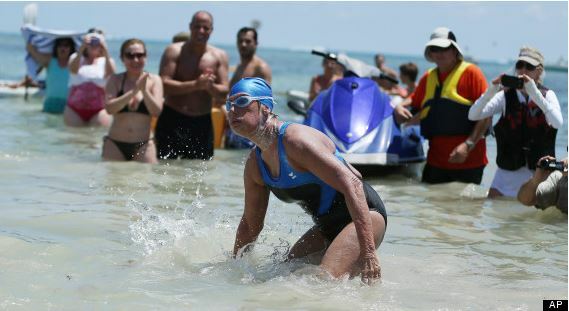 She began her third attempt in Sept. of 2011, but had to stop due to Box Jellyfish and Portuguese man-of-war stings. Now, she may be stubborn (you think?) But she is obviously no idiot. 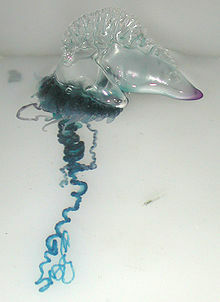 Anyone who has read this far, can see that the Jellyfish stings have been a major issue. As you can imagine, Diana also realized this. She began her fifth attempt on August 31, 2013 – again without a shark cage, but this time wearing a silicone mask, full bodysuit, gloves and booties. It seems that she had finally found the right mix of equipment and timing – as she stepped on to the beach in Key West – 53 hours after she began, at 1:55 EDT on 2 September 2013. She broke the world record set by Penny Palfrey in 2012 when Penny came within 26 miles of the Cuba to Key West goal. ‹ A Runner’s High and Elevation are two VERY different thing!